Deciding what to plant on your farm next year can be a challenge. You need to take into account trends in consumer demand, changing climates, as well as the resources you have available. New crops and new varieties may have become available. Some crops that made sense last year may not make sense to plant next year. FarmPlenty Local Crop Trends can help give you the information you need to make good decisions. Quickly and easily see what other farmers near you are planting. See what crops are becoming popular or unpopular. Find out how prices have changed over the past few years to help you plan for next year. In the past year, I've talked to many farmers and learned how hard it can be for them to make a living. Farmers have to deal with unpredictable weather, changing consumer demand, and endless pests and weeds. And while they are struggling to stay in business, they also have to take good care of the land and soil for future generations. The USDA has a wealth of data on crops and prices that can help farmers. The challenge is making it relevant for their own local circumstances. I decided to use my own extensive experience in data analysis and app development to create a better way for farmers to visualize the crop and price information most important to them. Showing all this information on a map makes this information easy to browse and understand. 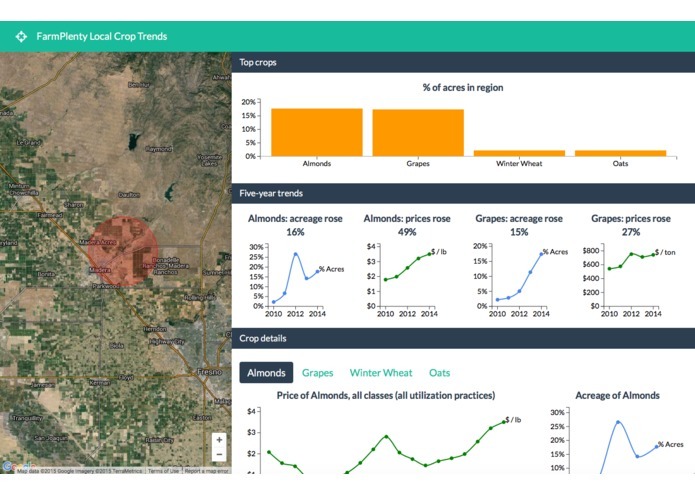 FarmPlenty Local Crop Trends shows you the top crops, trends, and prices near you. Select a point on the map to see information about all the crops grown within a five mile radius. The crop and price data comes from the USDA NASS and CropScape data sets. Click the crosshairs at the top of the page to center the map at your current location. Top crops shows the most popular crops grown in the region last year, sorted by the area that the crop covers within the region. Five-year trends shows the most prominent price and acreage changes in the region along with historical data for the past five years. 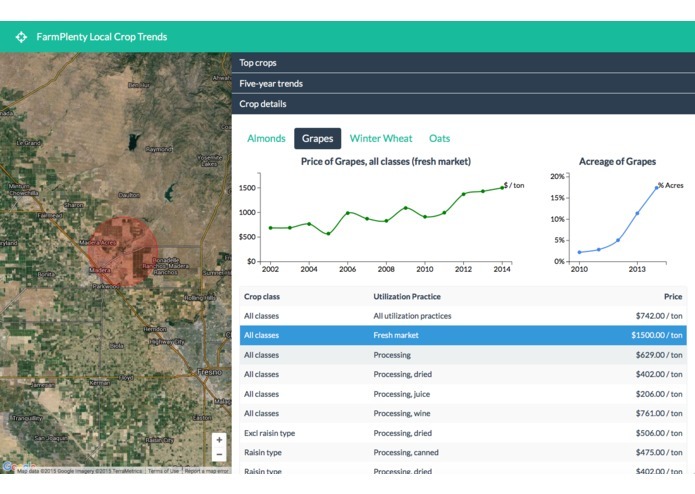 Crop details lets you see acreage and historical prices for one of the top crops in the region. The prices are the US Total prices for the selected crop, class, and utilization practice. Using this information, a farmer can better understand what crops are becoming more popular or unpopular in the region and anticipate changes in prices and demand. I wanted to create an app that works well on both desktop and mobile devices. I chose to use Bootstrap to lay out the UI because it adapts well to different screen sizes. 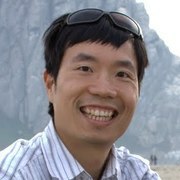 The Django backend requests NASS CropScape data using the Microsoft Azure API. I preprocessed the NASS Quickstats data to store crop price information in a SQLite database. The frontend uses Angular.js to request data from the backend and update the UI. I used Angular Google Maps to create the interactive map. The graphs are drawn using Angular Charts. The crop names in the NASS CropScape data don't exactly match the commodity names in the NASS Quickstats data. In addition, some of the CropScape crops are double crops. To deal with this, I had to create a mapping from CropScape crop names to Quickstats commodity names so I could cross reference the two two data sets in my app. Parsing the Quickstats data was also a challenge. There are so many types of data included in this data set, from prices to farm practices to farmer demographic information. Also, there was no documentation about the values of many of the fields. For example, prices are usually given in dollars per unit weight, but sometimes they also represented percent parity prices. The Farm Data Dashboard helped me understand how to find the data I needed, but it still required quite a bit of trial and error to determine the precise queries. It took some work to integrate all the various frontend UI frameworks including Angular.js, Bootstrap, Angular Google Maps, and Angular Charts so that the final result works properly and looks clean in both mobile and desktop environments. I had to modify Angular Charts a bit and customize some of the CSS. Learning Angular.js for this project. Creating a responsive app that works well in both desktop and mobile browsers. Looking up CropScape data using Google Maps. The USDA has a vast amount of agricultural data. I learned techniques for creating responsive apps that work well at different screen sizes. My original idea was to develop an app to help farmers better understand the tradeoffs of organic and conventional farming. I was hoping to find more information about pricing of organic vs. conventional crops, but was not able to find this in the NASS data. I would love to find this data and incorporate it into the app. I would like to improve the crop visualization, perhaps by displaying the top crops as an overlay on the map. I want to hear more feedback from farmers to find out what features are most useful. I would also like to do more sophisticated analysis of the data to derive more useful insights for farmers. Using software and technology to improve our food and agriculture system.